Walia mobile tower are most suitable for construction site, mines, port and defense establishment our machine are compact in size and east to maneuver from one site to other site. LED mobile light towres are design to provide high power, efficincy and performance. 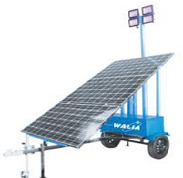 best equipment for working sites in night time Walia mobile light towers are powered by diesel engine or solar panels. Manual winch operated mast telescope upto 8000 mm, 360 degree mast rotation, mounted on a heavy duty wheel trailer.